There are currently 12 users online. - Changes in SPEC file. Obsoletes changed to Conflicts. - Should fix problem with root access. Beware, use it on your own risk !!! @Shturman How to manually remove Your Patch ? I did rm'ed i usr/share/openrepos-filecaseroot-patch and files in patchamnager/patches but still it shows some errors. I have problems updating sfos 'coz of this :( Any help would be greatly appreciated. Thanks ! in this steps you will completely remove my package from your phone. Ok... I don't know why it happens, but I'm sure my patch can't do automaic installation in any way. Aspecially after last update and if you have standalone version installed (StartAsRoot for FileCase). Or you do something wrong or Storeman app somehow causing to this installation. My favorite of SFOS file managers, (somehow thw others are difficult to look at). .. One request - after entering a directory, and then backing out of it, could you make it so it doesn't automatically scroll to the top, but remains in the position you were at? Thanks for your work. No, I didn't change nothing in the original package, I just given a possibility to run it as root. Good luck with that, Cepi Perez hasn't been seen for quite sometime now and as far as I know, doesn;t even have a SFOS device either. No i dont run patches, is there a source on github so i can fix it? error: XDG_RUNTIME_DIR not set in the environment. P.S. when you extract from .rpm, you will get the all files that I have (except .spec). It's not that RootFileCase dont run, the only thing is you dont have is root access when you like to change for example a .desktop file. 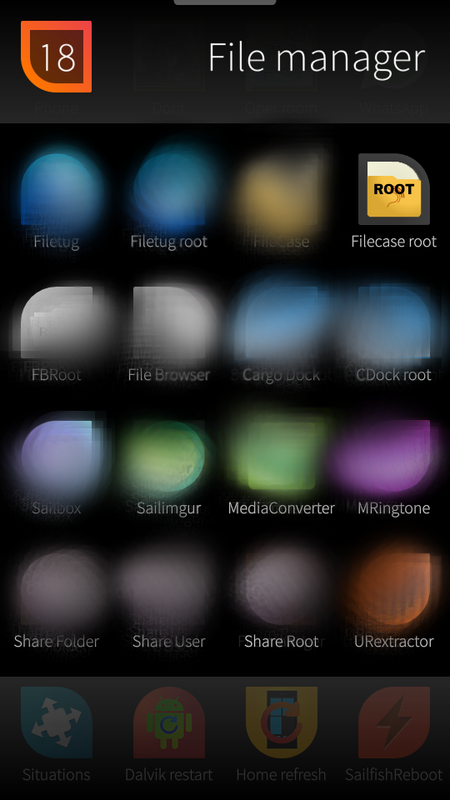 After that i run again the RootFileCase, and now i can change the file and have root access. Is there a way you can fix this for the X or do i need to do it myself, into your app ? If you want I can add checking of this to .spec file and recreate rpm. P.S. If I understand right you mean when you close RootFileCase the dconf folder disappear from /run/user/100000 ? When i set 600 nemo privileged to the dconf/user folder then it works perfect. Exec=sh -c "/usr/share/openrepos-filecaseroot/checker.sh && /usr/share/openrepos-filecaseroot/start-filecaseroot"
It will override existed start-filecaseroot file. Ok i have try it and wait then it works! I have also try the changes you write here but it dont work as good as with the checker.sh then it works the best, when i do the changes it works one time then not anymore even after wait for 2-3 seconds. Do you know more people that have the same problem with Sailfish X or maybe it localy on your device ? Objectifnul wrote on FileBrowser root that he got it working (also all other) by setting pass for root user (by installing sudo). I'm ask you not install sudo, but just go to terminal -> devel-su + your pass -> passwd root + follow what it ask. Now reinstall my package to get it like was before modifications and try again Open -> try edit -> close -> and the same again. Yes indeed hen i wat 2-3 sec it works perfect. Thanks i will add this. Ok i have done this, it works also but need to wait for 2-3 sec. before open it again when i close it. Cool, thanks... Did you tried another file managers like FileTugRoot ? It also need to wait 2-3 seconds (after setup of root pass) ? No sorry i dont have try that. I have add now a sleep 3 on the script now it works perfect no wait anymore on open en close. thanks for the helpt!